There is a saying, ”Happiness is doubled when shared.” The family and the friends are the ones of whose names come in our mind when we think of celebrating any good news. All we have to do is to throw a party and take some preparations to make the time worthwhile. Many get perplexed thinking about the preparations needed to make an event successful. This is the biggest motivation of the Even3App. At some point every people feels the necessity of arranging any event in their life. The occasion may vary from person to person. It can be a birthday party, wedding ceremony, family reunion, barbeque party or any other kind of meetups. 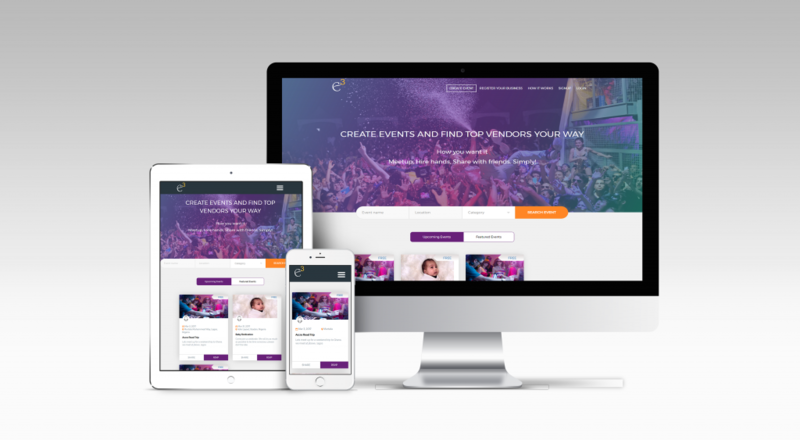 This application lessens the hassles they have to go through to plan the whole event and to make it a success not by any boring way but making the process easier, time-efficient and interesting. 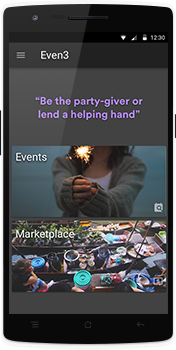 This app is not only a helpful for the event managers but also a great opportunity for the entrepreneurs like makeup artists, DJ, Musicians, photographers and gifts and souvenirs stores etc. to bring more customers to their services. The people of the present world are busy and fast running. While planning an event, there will be a lot of things to consider. Though people can afford the expenses of the arrangements, they cannot afford their time and energy for the process. So, a cross platform bringing the nearby marketplaces and the customers all together can be of great help to them. The first challenge of the event is the venue selection. Going to various venues and finally selecting the best one from a lot of options is a stressful job. The event decoration is another challenge for arranging an event like a wedding, a birthday party or any official events. Selection of a bad catering service for the event can ruin all the fun. All the preparations need a lot of time and effort to manage an event. This is the biggest challenge for a busy generation like us. How nice it would be to have an application providing all the necessary informations to arrange an event staying at home through just one click. The Even3 app provides a user-friendly environment for both the entrepreneurs and the customers. The overall outlook is based on party theme to make one feel cheerful. Just come here and choose whether you want to search an event or to search a marketplace to learn more about them and even hire them. One can also search for events and marketplaces. If you are the event manager and choose to hire a business to handle your needs, then they will be informed to contact you through a mail. While a user is hiring a vendor, they can rate and write reviews about their services. This will make the vendor happy and help other users to make an informed decision on what’s best for them. Otherwise, if you are just a person who is looking for nearby public events this is the right place for you. You’ll be shown the events that are happening right now in your nearby places. If you want to filter the events by location, you can also do that as well. While creating a new event, come to this page and fill up the necessary information about the event like name, location, start and finish date, contact information, event description along with the event cover photo. One can easily make their event private if they want or just leave it as public for anyone to see and attend the event. If you are an entrepreneur, this is the place for you to introduce your business to the system. Just fill up the necessary details of your business like the name, location and how the customers can reach to you for ordering their services and then you are done. The app does not only let you create private events. You can also arrange any public event like a fair, concert or anything of this sort. 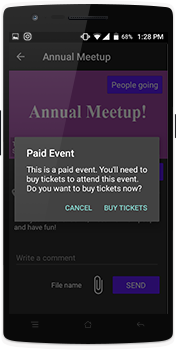 You can also make the event paid by serving tickets to the customers. In case of paying for the tickets, the users can pay through Paystack or Stripe online payment services. After the payment, the app will generate a QR code for later use. If there is an event of your interest you will be informed through the emails. So have no fear to miss an event and regret later. Have you recognized the motive of the app, events-vendors match? Are the users getting all information needed to hire a service? Do you get satisfied using the app? Do you find the payment process reliable? Would you like to share the idea of this app with your friends? Investigating the experience of the user after using the app. Observing the response of the user while scanning the screens. The demand of the users. Granting the app with quality service giving satisfaction. The designed is planned with utmost concern and efforts observing the lifestyle of the Nigerian people. Every frame is designed to please the need of the users and assure their satisfaction. Related Apps: Eventbrite Organizer, Complete Event Management, Umbrella Events, Orhideea Design Event Planning, Neelkanth Event Management, Explara Event Manager etc.